Birds have fascinated human beings since early times. There have been many books, notes, and descriptions of birds and their behaviour in world literature, including several Indian languages. Birds have a special place in classical Tamil literature. Names given to some birds in ancient Sangam Tamil literature are still the same and in use (e.g., Koogai – Barn Owl and Thookanang Kuruvi – Weaver Bird). The famous old Tamil verse on White Stork, ‘Narai Narai Sengal Narai’, gives us a glimpse of the observation skill of the poet Sathi Mutha Pulavar on the migratory behaviour of this bird. Birds are mentioned even in Tamil film songs. For instance, I have made a list of twenty songs mentioning Chittu kuruvi or House Sparrow. 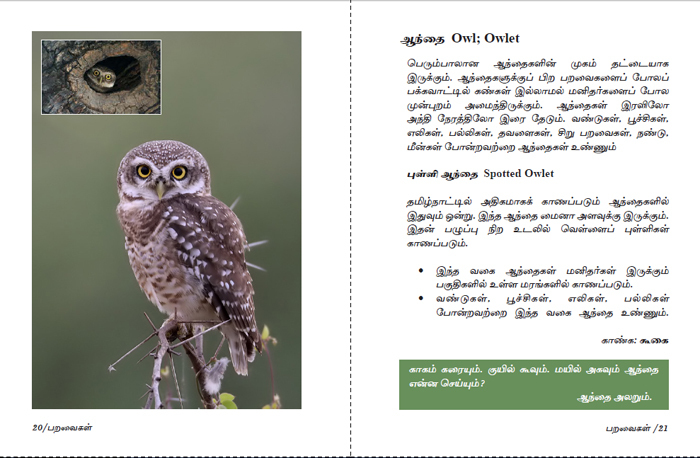 Although there are mentions of various birds in old Tamil literature, proverbs, contemporary poems and film songs, and birds are also depicted in temple murals and other paintings, there are as yet few popular science books and field guides on birds in Tamil. In recent times, efforts to popularise birds and their behaviour in Tamil were pioneered by the famous naturalist M. Krishnan. He wrote about birds and other wildlife of India in various Tamil magazines and newspapers. In 2002, Krishnan’s writings in Tamil were compiled by Theodore Baskaran, another accomplished nature writer in Tamil in the book Mazhaikalamum Kuyilosaiyum (The Monsoon and the Call of the Koel). M. Krishnan also wrote about birds for the Tamil Encyclopaedia Kalaikalangiyam, published in ten volumes between from 1954 to 1968 by the Tamil Valarchi Kazagam. These articles on birds have been compiled and brought out in the book Paravaigalum Vedanthangalum (Birds and Vedanthangal) by Tamil writer Perumal Murugan (read his foreword for this book here). This collection includes M. Krishnan’s booklet on Vedanthangal Bird Sanctuary, which was published in 1961 by the Tamil Nadu Forest Department, an English version of which is available here. 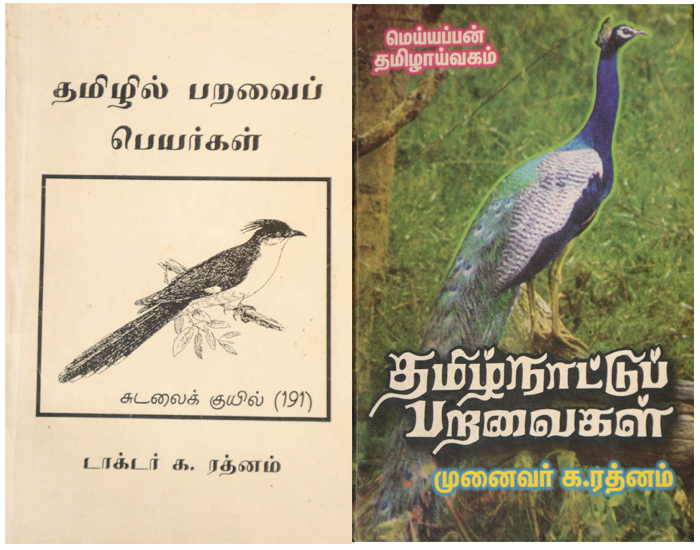 Among the significant works on birds to emerge in Tamil after M. Krishnan, is the book “Theninthiyap Paravaigal” (South Indian Birds) authored by Dr. K. Ratnam, a retired Tamil professor. Published in 1974 by the Tamilnattu Padanool Niruvanam (Tamil Nadu Textbook Corporation), this book was part of school and college curriculum for a while, but is now out of print. 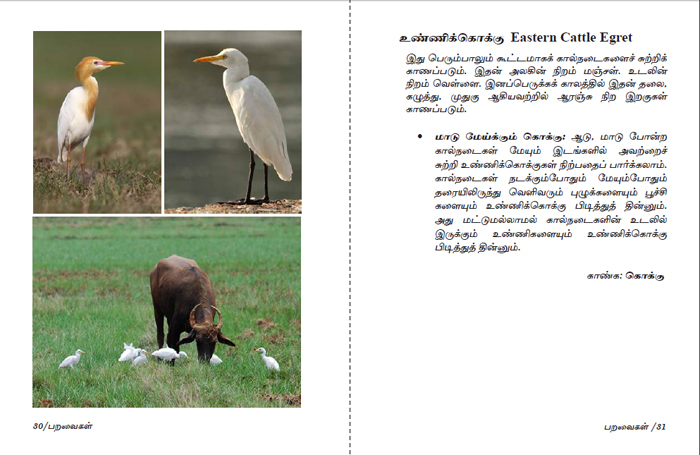 After this Ratnam also produced another important publication Tamizil Paravai Peyargal (Bird names in Tamil) in 1998. In this amazing work, he compiled Tamil names of 410 bird species, referring to various books and sources including M. A. Badshah’s Checklist of birds of Tamil Nadu with English, scientific and Tamil names. 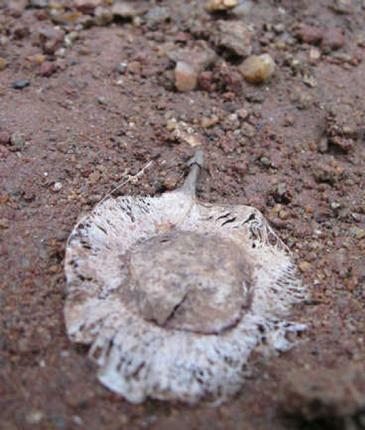 Ratnam coined new names for species that did not have common names. This book, which I clearly remember buying in 1995 at the the 8th World Tamil Conference book fair at Thanjavur, is one of my prized possessions. It is now available online for free download. Still, Ratnam’s landmark book came a few years later. 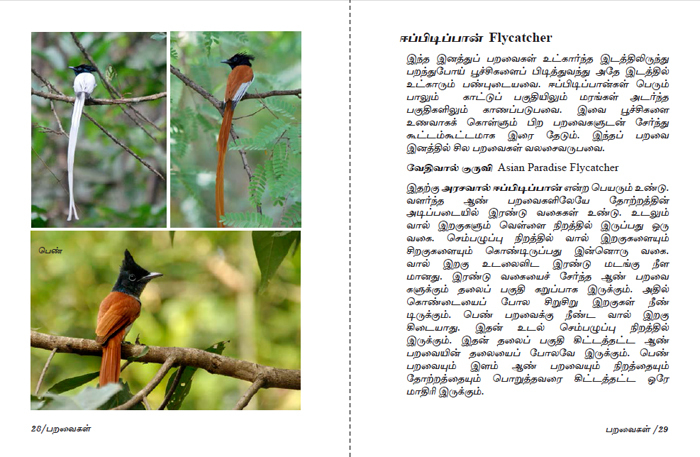 Published in 2002, Tamilnattu Paravaigal (Birds of Tamil Nadu) became the first field guide for birds in Tamil, covering 328 birds species that occur in Tamil Nadu. 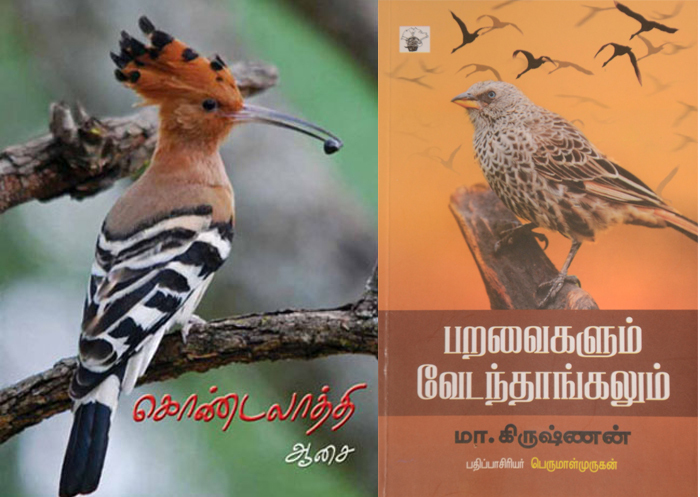 Other nature writers in Tamil, including S. Mohamed Ali, Theodore Baskaran, Athi Valliappan, and Kovai Sadasivam, have published several articles and books on birds. Another acclaimed work on birds in Tamil is by Asai, a modern Tamil poet who is a writer and editor of Cre-A publications. Asai’s Kondalathi (Tamil name for Eurasian Hoopoe), a collection of his poems about birds, is a pioneering work in modern Tamil poetry. Kondalathi, Tamil poetry on birds by Asai, and Paravaigalum Vedanthangalum, a collection of M.Krishnan’s articles on birds in Tamil. Cre-A Publications is one of the highly reputed publishing houses of South India. Apart from the well known Kriyāviṉ taṟkālat Tamiḻ Akarāti (Tamiḻ-Tamiḻ-āṅkilam): Cre-A Dictionary of Contemporary Tamil (Tamil-Tamil-English), Cre-A has published an impressive array of Tamil literary works and translations from other languages. Cre-A’s co-founder and managing editor, Cre-A S. Ramakrishnan, has also pioneered the publishing of books on nature and environment, such as Inthiavin Sutruchulal (1986), a translation of The State of India’s Environment, Maram Valarpu (Tree Planting), and the famous Spiders: An Introduction by K. Vijayalakshmi and Preston Ahimaz. I was pleasantly surprised therefore when Asai approached me with his idea of bringing out a dictionary of birds in Tamil to be published by Cre-A. He had made an initial draft of the manuscript with about 50 species of birds, taking help from Dr. R. Bhanumathi, an environment educationist experienced in the art of puppetry. 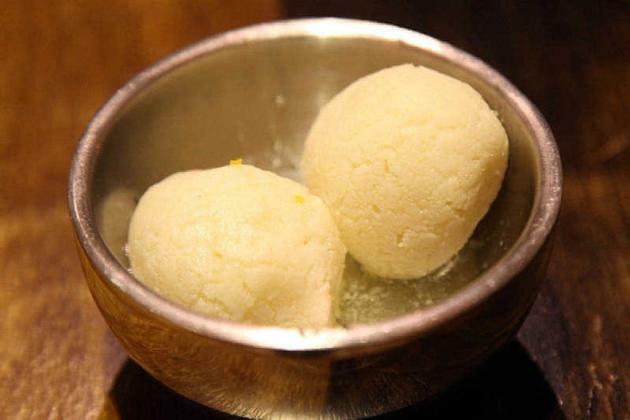 The initial list was extracted from Cre-A’s Tamil Dictionary. Over the next few months, we worked together on developing this and decided to bring it out as a photographic field guide. This guide is produced for anyone who are fascinated by birds and want to learn about birds. Besides the species accounts and photographs, there is a detailed introduction to the classification, nomenclature, and history of Indian ornithology. The book also lists various Indian research institutions, including those that offer courses on ornithology. To help birdwatchers who wish to know more, there is also a list of other field guides on Indian birds, tips on birdwatching and bird identification using calls, plumage and nests. 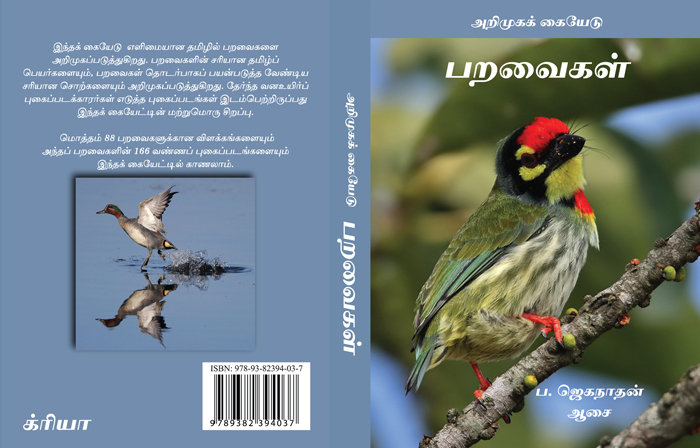 There are brief sections on bird migration, conservation, importance of birds, list of bird sanctuaries and links to Important Bird Areas (IBA’s) in Tamil Nadu and other books on birds in Tamil. This book is a collective effort of many people. I take this opportunity to thank Mr. Athi Valliappan and Mr. Theodore Baskaran for their comments on the draft, all the photographers who generously contributed their wonderful photographs, Mr. Balaji for designing this book attractively, other staff of Cre-A for their help in various ways, and Divya and Sridhar for their encouragement. This book was a brainchild of Cre-A and I thank Mr. S. Ramakrishnan and Mr. Asai for giving me this opportunity. To buy this book contact Cre-A. Email: creapublishers@gmail.com (Tel: 044 – 42020283).